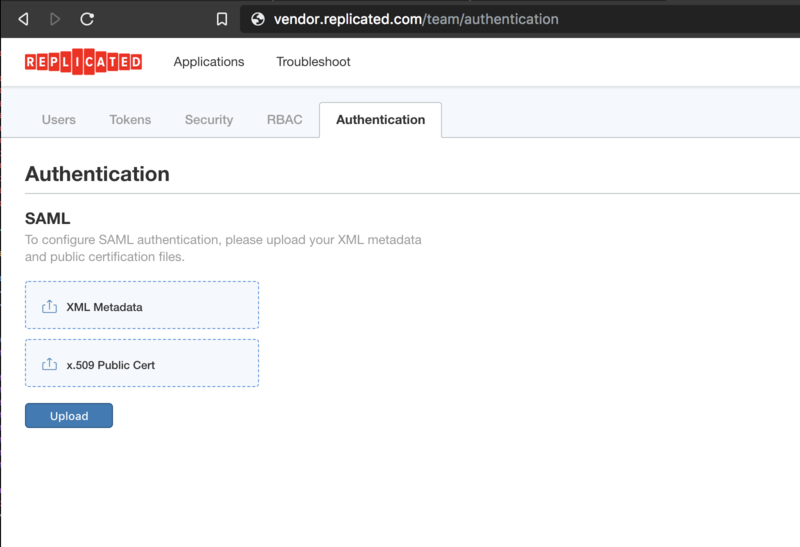 To configure SAML in the Replicated Vendor Portal, start by logging in to an account that has Admin access. When first enabling SAML, we don’t recommend that you disable username/password access at the same time. It’s possible (and recommended during testing) to support both SAML and non-SAML authentication on your account at the same time. Your SAML provider will provide an XML Metadata file and their x.509 Public Cert. For more information on supported SAML providers and how to find these files, please visit the supported SAML providers guide. In this guide, I’ll configure Replicated to use Okta for authentication. I’ve downloaded these two files from Okta and upload them into each of the fields provided.